This movie, is indeed my favorite of all the Inuyasha films. First of all, the artwork looks really pretty, and the plot of the story is very enjoyable. This movie basically gives you a little flashback into Inuyasha's past, and who his parents were. Like any Inuyasha movie, there's plenty of action to see. In my opinion, the movie could have went a little bit deeper into the past, but overall it's great! Out of the four Inuyasha film installments, this is probably the best in terms of plot. We get to see a little more about Inuyasha and Sesshomaru's father, the dog demon. In addition, we get a better understanding about the heirloom swords that passed down to to both Inuyasha and Sesshomaru: tessaiga, tenseiga, and a third that was not passed down to either: sounga. The film focuses mainly around Inuyasha, Sesshomaru and the third sword along with the story behind it. I won't be going into details about the plot since it'll give away spoilers. Also, best part about the film, we get to see more of Sesshomaru. I think this movie did a nice job of adding to the pasts of Inuyasha and Sesshomaru while also providing some solid action. Adding a third sword was a nice way of dragging the brothers into the same conflict. Besides it also helped to show how the two felt about their father. It did a nice job with Sesshomaru and the kind of relationship he had with his father. Also shows the change from a guy who didn't see the need to have something to protect to someone who would jump in to save Rin when in danger.The story really was about those brothers. In that they did a good job. The battles were well done. Made good use of the abilities of Tetsusaiga and Tokijin. Whether it was the final battle or the skirmishes between the brothers it all looked great. The music as always is great with Inuyasha. Whether it's the fighting scenes or simply a conversation the music really adds to the atmosphere. Love adding the staples of the series like when Miroku uses his wind tunnel. 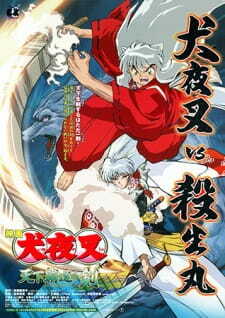 Overall I think this is a good movie if you like the rivalry between Inuyasha and Sesshomaru. Heck it's a good movie if you like Sesshomaru since this is the most focus he gets in any of the Inuyasha movies. You may wonder about some of the explanations given, but considering these are movies they can be glossed over. The important thing is that this is an entertaining movie and one that should definitely be checked out.